Funny word but what is a jacobean print? Jacobean is a woven fabric that features embroidery and dates back to the seventeenth century. These woven designs often feature stylized floral patterns, fruits, small animals and birds. It is difficult to know how to pronounce this odd word but think of the name “Jack” and place the emphasis on that first syllable: Jack o be an. Jacobean prints are strong and durable and most commonly used for upholstery projects, draperies and small accesssories such as footstools, ottomans and accent pillows. They will add color and pattern to a living area, master bedroom, library or den. 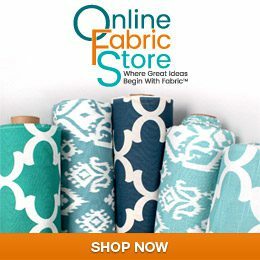 Take a look at some of the jacobean prints offered here at Online Fabric Store. Historically, many jacobean prints have a slight Asian feel such as this Richloom fabric called “Brizio” in a vintage colorway. P Kaufmann’s “Dahana” offers the stylized floral patterns so common to jacobean prints. Animals and birds are a common theme found in jacobean prints as seen in this sophisticated design by Richloom called “Mirth”. Is there a spot in your home that can be enhanced through the use of a jacobean print?